"Oh, what was your name in the States? Say, what was your name in the States?" California has been a land of new beginnings. A place where one could make a fresh start and leave a flawed past behind. So it was with William Alexander Leidesdroff, who became one of the most successful businessmen, merchant and politician in Mexican and pre-statehood California. His early death exposed his personal secrets and created a legal controversy that went to the State Supreme Court. The Court's rulings set a precedent for California inheritance law. Interpretations of the Leidesdroff inheritance court decision are often written by those without legal backgrounds. Consequently the information is usually in error or confusing. This article is an attempt to correct the historic record by relying on a legal analysis of the Leidesdroff case by Judge A. F. Bray whose writings are preserved in the Contra Costa Historical Society archives. In Contra Costa County Leidesdroff was an important landowner. Rancho Acalanes was one of two large ranches belonging to Leidesdroff in Northern California. The Acalanes Rancho covered the area where Lafayette is today. In 1847 Elam Brown, famous Contra Costa pioneer and the second American to settle in Contra Costa, was looking for land to buy. He had been cutting timber in the vast redwood forests that once covered the Oakland Hills. Now he wanted to become a rancher. However native Californios would no longer sell land to the despised gringo newcomers who were flooding uninvited into Mexican Alta California. However William Leidesdroff was a relative newcomer to California. For the right price he was willing to sell to anyone who wanted to buy property in what was then the wild and unsettled wilderness of Contra Costa. Elam Brown bought Acalanes Rancho and took possession in 1848. He soon turned Acalanes into a productive ranch. Elam Brown became a wealthy and influential man, serving two terms in the California state assembly. William Alexander Leidesdroff was born in the DanishVirgin Islands on October 23, 1810. His mother was of mixed blood which included some African descent. His father was a Dane, born in Denmark. His mother, Anna Maria Sparks, was described as a beautiful, fair skinned quadroon. She was Leidesdroff senior's common-law wife producing three more children, two girls and another boy. The boys were described as slightly swarthy but the girls were fair skinned. All the children were formally adopted under Danish law by Leidesdroff's father, a manager of a sugar plantation. Some sources say that William Alexander Leidesdroff was sent to Copenhagen at 15 to complete his education. After he returned to the islands, William began a new life in New Orleans helping to manage a family business. He turned out to be a brilliant businessman. As young as he was, he soon was one of richest cotton brokers in New Orleans. Leidesdroff also was a ship's captain sailing between New York and New Orleans. In 1834 at the age of 24, he became a naturalized American citizen. His financial success allowed him to enter into the highest rungs of New Orleans society. Leidesdroff fell in love with the beautiful daughter of a prominent New Orleans family. In 1840 on the eve of their wedding, the family discovered that William's mother was partly black. The news had terrible consequences for Leidesdroff. The wedding was canceled and his future business prospects in New Orleans were ruined. Devastated, Leidesdroff sold what he could and bought a 106 ton sailing ship, the Julia Anna. He sailed to the Hawaiian Islands in 1841. He was familiar with Hawaii as he had traded with the islands as early as 1838. From Hawaii he sailed to Sitka, Alaska and made friends with the Russian commercial interests. Then he sailed down the coast to Yerba Buena, a small, sleepy Mexican village on the shore of a magnificent harbor. Here Leidesdroff saw fantastic opportunities for trade and acquiring land. His past was now thousands of miles behind him in New Orleans and the West Indies. It was chance for a new start in a new world and in a new country. Leidesdroff soon made a small fortune trading cow hides to Hawaii for sugar. He bought numerous town lots in Yerba Buena (today's San Francisco). He also built the first hotel, called the City Hotel and constructed a warehouse and lumberyard along the water front. Leidesdroff built a fine home where the Bank of America building stands today. He loved flowers and enjoyed the only flower garden in Yerba Buena. Leidesdroff became a business agent supplying the Russians and assisted in trying to collect the debts that John Sutter owned them. It was the beginning of a new life. Fremont wrote that Leidesdroff lived with an attractive Russian mistress. On his arrival in California, William became a Mexican citizen in order to obtain a grant of 35,000 acres in today's Sacramento County. The ranch was named Rancho Rio de Americanos. 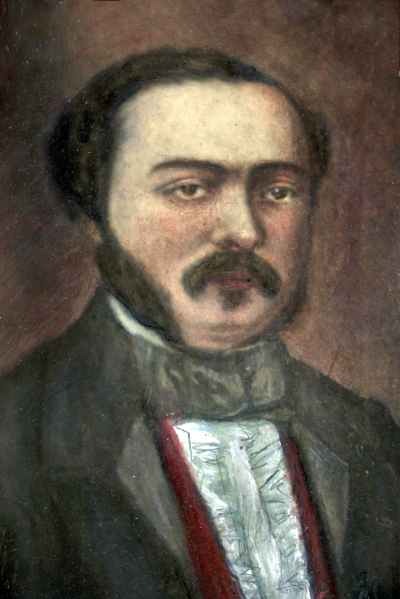 Within only three years Leidesdroff had become one of the most important men in Mexican California. Thomas Larkin, Consul General of the United States, appointed Leidesdroff Vice Consul for the San Francisco Bay area in 1845. Leidesdroff is famous in California history as the first to sail a steamship on San Francisco bay. The Sitka was underpowered and a commercial failure but marked the beginning of a new era in California transportation. Larkin, in an official report to Washington, described William Alexander Leidesdroff as "Merchant and Farmer. Born in Denmark. Aged 33 years. Single. Active, bold, honourable (sic), passionate, and liberal. A linguist of medium talent. Formerly Sea Captain of New York. Influence contested. Decidedly partial to the United States." Leidesdroff's birthplace, mother and life in New Orleans were Leidesdroff's secrets and remained so until his death. During the Mexican period, he was on the local town council. Once California was American territory, he became extremely active in San Francisco politics. Still in his 30's, Leidesdroff became the city treasurer. He was elected to the school board and donated land for the first public school in San Francisco. On May 18, 1848 William Alexander Leidesdroff suddenly died. He was only 38. It is generally accepted that typhus was the likely cause. However some pointed to typhoid, stroke or even hints of murder. San Francisco was plunged into mourning. Flags flew at half staff, businesses closed as well as all the schools. He was buried with honors at the front entrance to Mission Dolores. W. A. Leidesdroff died intestate. No will was ever found. California had not yet passed any inheritance statutes. Only days before Leidesdroff's death gold was discovered on Rancho Rio de Americanos potentially making whoever owned the ranch one of the richest men in California. California moved to claim the estate on the grounds that any heirs of a Danish born Leidesdroff would be aliens. Under both Mexican and old English Common Law inheritance by aliens was illegal. But now another legal complication was added to this murky legal stew. In 1848 Captain Joseph Libby Folsom, U.S. Army, was the Custom Collector and Harbor Master for San Francisco. The two men were well acquainted because of Leidesdroff's business dealing with the U.S. Army. As Custom Collector and Harbor Master, Folsom had access to ship's records. Tracing the New Orleans home port of Leidesdroff's old ship, the Julia Anna, was not difficult. Seeing his opportunity, Folsom immediately took leave from the Army. In New Orleans he discovered that William Leidesdroff was not born in Denmark but in the Danish Virgin Islands. Folsom traveled to the West Indies and located Leidesdroff's mother, Anna Sparks. William Leidesdroff's father had died in 1846. Folsom promised Anna Sparks $75,000 for the title to Leidesdroff's estate. There is some evidence that Joseph Folsom only paid Anna $25,000 as a initial first installment. It was then that she signed over her rights to the Leidesdroff estate to Joseph Folsom. He returned to San Francisco and presented his claim for the Leidesdroff estate to the courts. Many were outraged as the estate's value now was now estimated at over a million dollars. Some felt that Folsom had misled Anna Sparks on the true value of Leidesdroff's estate. Nevertheless the case wound its way through the lower courts with the State of California fighting Anna Sparks/Folsom inheritance claims to the growing Leidesdroff estate. According to Justice A. Frank Bray, in 1855 the California Supreme Court finally ruled in favor of the Sparks/Folsom claim to the estate. Because Leidesdroff died before there was a State of California and before there were any California inheritance laws, the Court ruled that the question of inheritance would have to be decided under United States law. The Court further stated that the policy of the Government of the United States had been to encourage the immigration of foreigners and a system of preemption had been adopted in all the territories and new states that there would be no discrimination between foreigners and native citizens. Foreigners could hold property and may inherit. In the absence of legislation upon the subject and there being no legislation in California against it, the Court held that the vast Leidesdroff fortune was inherited by Anna Sparks/Folsom. This established the basic inheritance rule in effect today. Of course the ruling of the Court was not the end of the story. Joseph Folsom was a rich man for only a few days following the Court decision. He himself died suddenly at 38 - the very age that William Leidesdroff had also died seven years before. In 1856, the executors of Folsom's estate auctioned his property over a two day period. More than a hundred bidders were successful. The auction raised $1,442,232.35. Various legal challenges to Folsom's claim to the estate continued for another ten years but all were dismissed. It is ironic that Leidesdroff is mostly honored today for a secret he tried so hard to hide during his lifetime. Fifteen miles of State Highway 50 is named after him. During Black History Month he is acclaimed as an important black California pioneer who was supposedly the first black millionaire. We can all applaud Leidesdroff for his important contributions to public education, holding the office of San Francisco city treasurer, working to build San Francisco into a modern city or running the first steam boat on the bay. Leidesdroff's life is both a story of success in a hostile world and of sadness over the personal secrets he had to keep. While we have not yet become a perfect society, William Alexander Leidesdroff's life remembered shows how far we have come. Anon, Folsom History Museum, Joseph Libby Folsom (1817-1855), www.folsomhistorymuseum.org/history.htm. Bray, A. Frank, Superior Court Judge, March 1, 1937, A Series of Talks on the Human Aspects of Early California Supreme Court Cases, No. 44, Station KLX, Oakland, CA. Fraser, J. P. Munro, 1882, History of Contra Costa, California, W. A. Slocum & Co., Pub., San Francisco, 710 pages. Hammond, George P., Editor, 1953, The Larkin Papers, Vol. IV 1845-1846, University of California Press & Cambridge University Press, 411 pages. Palgon, Gary M., Nov. 1, 2005, W. A. Leidesdroff: First Black Millionaire, American Consul and American Pioneer, (contains 1855-56 newspaper clippings), 96 pages. Rego, Nilda, Dec. 20, 1997, Lafayette Has Roots In Ranch, Contra Costa Times, p. D5.